We won't waste time telling you about the insignificant details of this incredibly playful, black and white dress. Here's what you need to know. One - its made of a cotton blend that's soft to the touch and ridiculously comfortable! Two - its allover, black and white, floral lace print makes this dress really charming and easy to pair with just about anything, including neon tights, a muted, knit cardigan, or printed rain boots. You name it! 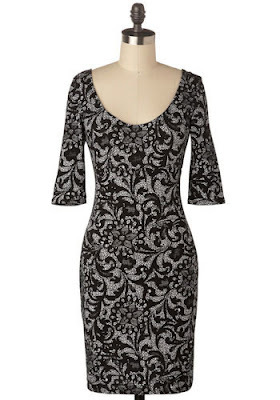 Three - it's tailored with your figure in mind with a deep scoop neck and an even lower scoop back that will flatter your curves perfectly, giving you the chic confidence to sport this frock both at the office and the club. Don't delay - wear this darling dress with fluorescent fishnets, weathered ankle boots, an oversized boyfriend blazer, and your favorite pendant necklaces for an ultra hip ensemble!